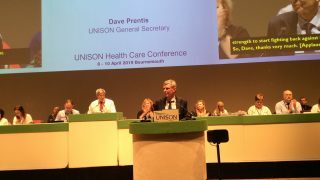 “UNISON has always led the fight against privatisation, in the past all too frequently against the New Labour leadership. “Year after year, I stood at this rostrum, and was heckled and hissed at by New Labour ministers for opposing their privatisation plans. “Gullible ministers, who’d been seduced by the promises of vulture capitalism, sucked in by G4S, Capita and Carillion, and bedazzled by the chief executives of multinational companies who promised so much, yet delivered so little. “But much has changed thanks to the leadership of Jeremy Corbyn and John McDonnell. Those dark days are gone. “The country must never go back to the time when it was beholden to the profiteers, seduced by their false promises, and by the mantra that private was good and public bad. “A mile from here stands the Royal Liverpool Hospital – a shell of a hospital, that’s half built, effectively a £300m building site. “It’s been abandoned by Carillion, the company that everyone said was too big to fail. “Carillion, a private company that was praised by the Tories and lauded by New Labour, has now left a trail of destruction in its wake. “Workers were unpaid and apprentices were sacked, and this great city has been left without its promised new hospital. An epic monument to failure. “And just as Grenfell will forever be associated with neglect, so Carillion will always be associated with greed. “But at long last the Labour Party is led by those who oppose privatisation of all our public services. “I’ve waited all my life for this. Our party, led by Jeremy Corbyn – a proud UNISON member, has always stood with us on protests. the kind of Member of Parliament our party needs, who stands with you when times are tough, and not just when they want something. “So everyone in this hall, and every MP must get behind our leader, get behind the policies, and get behind the party to campaign for the best manifesto ever put to the British people. “It’s a party that works not for the rich but for the cleaners, the carers, the cooks, the teaching assistants, nurses, and all other public sector workers. “They need our party preparing for power, looking outwards, moving upwards and standing united. That’s what our country needs. “That’s what the children sleeping rough on the streets of cities like this need. And what the dozens of Birmingham care workers who travelled here yesterday need. “They’ve taken 21 days of strike action, fighting pay cuts, and a cut in their hours. “We need unity now more than ever, to be united behind radical policies, not outdated dogmas of the past, united behind a leadership that is no longer timid. “For the first time in a generation, we have the opportunity to be bold and bring public sector workers who’ve been privatised back into local government, and back into the health service where they belong.